Japan Centre’s Toku Restaurant is now back and fully operational in its new location next to the Japan Centre Food Hall on Regent Street. We now offer our full range of authentic Japanese food, from sushi to traditional Japanese hot dishes. 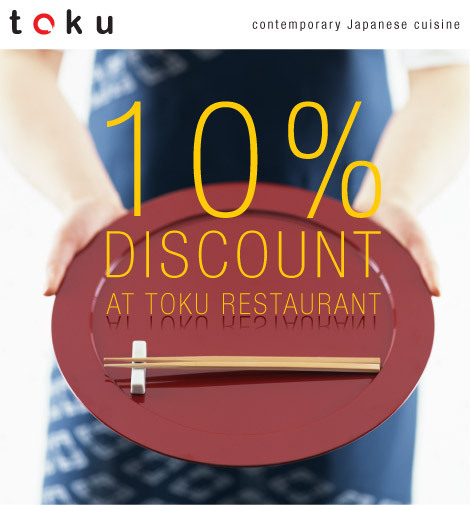 Please bring with you the discount voucher (below) next time you visit for 10% off your meal and enjoy the Toku dining experience 10% more! One of the things I miss about London is the Japan Centre, so when I heard the restaurant was re-opening I started to figure out when I could get home again to check it out. I’ll be over in November, and this voucher is a real bonus!! Can’t wait..!